Written at age 9, to his grandmother, Feb. 1881. 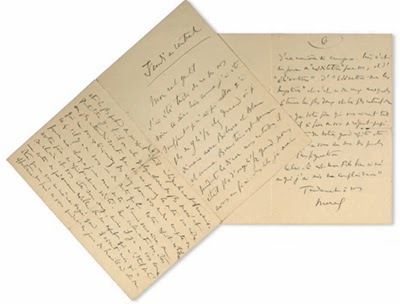 Eight signed autograph letters written by French novelist, critic and essayist Marcel Proust (1871-1922) are being sold by Christie's-Paris in its Importants Livres, Anciens Livres, Livres d'Artistes, et Manuscrits sale November 6, 2013. Offered in eight individual lots, estimates range from $2,000-$12,000. 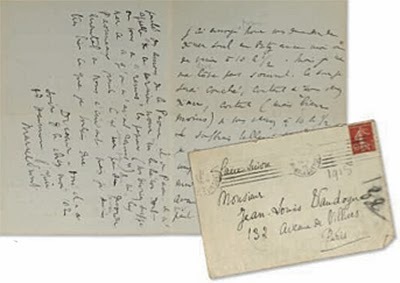 The charming two-page letter above was written by Proust to his maternal grandmother, Ms. Nathe Weil, on the occasion of her birthday, February 5, 1881. He was nine years old. 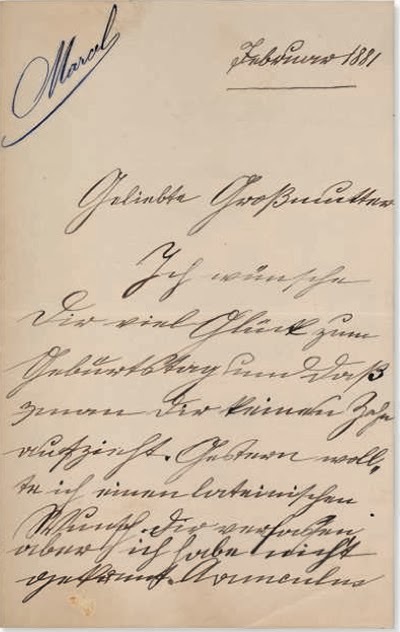 He signed it "Marcel Proust" in German Gothic, and we smile: children seem to enjoy signing their full name as an exercise in identity and sounding adult, even to members of their immediate family. To Lucien Daudet, c. late 1897. 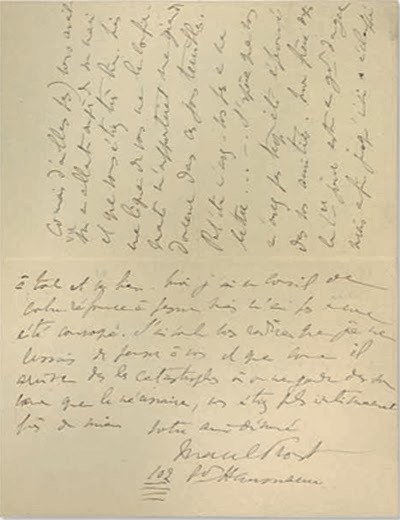 In this letter, dated "Thursday returning" (likely late 1897-early 1898) Proust writes to "mon rat gentile," Lucien Daudet, shortly after the death of Daudet's father, novelist Alphonse. It is believed that Lucien Daudet and Proust had been lovers. Unable to attend a dinner, Proust sends his regrets. "[ ... ] And I thought you had considered me cruel for not being master over my body and unable to go near you, to be in this state of health your father had predicted and he advised me that the vision of genius and goodness with which he lived could probably lead us to all wonderful things [...] I wonder at times [...] if he did not die without you known in the most exquisite depths of his mind fully transmitted [...] not only were you his flesh and blood, but you were sort of real presence of mind [...]." To la princesse Soutzo (future wife of Paul Morand). No date (c. 1917). Est. $5,400-$8,000. 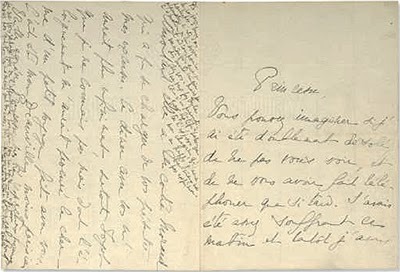 On August 24, 1917, Proust wrote four-pages to his confidant, Princess Hélène Soutzo, the future Mrs. Paul Morand, regretting taking so long to acknowledge her invitation to dinner, to which the princess had also invited Soutzo Scheikevitch Ms., Mrs. Harcourt, Jean de Gaigneron, and Etienne de Beaumont. "[...] When I woke up at 8am, your words gave me pleasure and pain, by your kindness to invite me for the evening I could love you more, and the impossibility, because of the time, to join. Celeste called on the telephone, you were out. Had we called the hotel [the Ritz] [ ... ] it seems that [...] it could present my excuses. 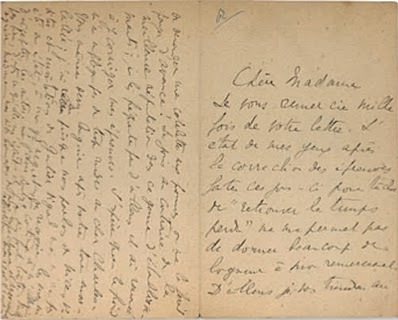 I would have infinitely liked this dinner with you, especially Foyot [a restaurant located at the corner of rue de Vaugirard and Rue de Tournon]..." (Proust Correspondence. Text established and annotated by Philip Kolb . Volume XVI . Paris : Plon, 1988 , letter 108 , p. 218). To Jean-Louis Vaudoyer, February 11, 1915. On February 11, 1915, Proust wrote to Jean-Louis Vaudoyer asking about his friend and Vaudoyer's brother-in-law, historian Daniel Halevy, and complaining about his health. "I was told that you had seen Mrs. Wood Rouvray (who I do not know) [ ... ] and you were very good. But a line may bring me great sweetness in these terrible days. [ ... ] I hope you have not been tested too much in your friendships. From the first day my brother [Robert] was in danger, but so far has escaped and everything goes well. I have advice against reform [ ... ] I wanted to tell you that I kept thinking about you and as it happens in disasters one keeps in his heart that which is needed, and you were more intimately mine" (Proust Correspondence. Volume XIV. Paris: Plon, 1986, letter 18 , p. 51-52) . To Madame Anatole Catusse, undated (c. Dec. 1917). Mrs. Anatole Catusse was very close to Mrs. Proust with whom she shared a love of music. In December 1917 Marcel wrote her a four-page letter. "Dear Madam, thank you a thousand times for your letter. The state of my eyes after correcting tests does not allow me to give many thanks at length." He also remembers their meeting in restaurant (very likely the Ritz): "The other night, in the hotel you did me the honor to come to dinner, you had me in the crystal revolving door and gave excellent advice." With the help of Ms. Catusse Proust tried to sell some furniture which he had received offers on to buy. He goes on describing his financial health, so bad, apparently, that even fruit isn't taking any chances on him. "If I had the idea to ask for a chopped apple, it would make me pay in advance." (Proust Correspondence. Volume XVI . Paris : Plon, 1988 , letter 168 , p. 325-326 . To Jean-Louis Vaudoyer, no date (early Oct. 1918). In an undated (early October 1918), four-page letter to his friend, novelist and critic Jean-Louis Vaudoyer (1883-1963), that he marked "confidential," Proust amusingly writes about a Proust-pastiche he saw in the magazine Le Crapoullot. "They sent me a number of the Crapouillot causing me a slight annoyance because it contains a really stupid pastiche of me, but causes me great joy: you do me the honor and friendship to dedicate my wonderful pastiches. That of Gerard de Nerval in particular is an ongoing miracle [ ...] As pastiche that the pretension to forge my way, I am wrong to be indignant. It is only the consequence of Vanderem signs and other items that ignoring the composition of my work seem to say that I am the ' memories and am writing my memories of the fl [ ... ]" (Proust Correspondence.Volume IV. Paris : Plon, 1933 , p. 79). (“On m’envoie un n° du Crapouillot qui me cause un léger ennui car il contient un pastiche de moi vraiment stupide, mais me cause une joie profonde : vous me faites l’honneur et l’amitié de me dédier des pastiches merveilleux. Celui de Gérard de Nerval en particulier est un miracle continu [...] Quant au pastiche qui a la prétention de contrefaire ma manière, j’ai tort de m’en indigner. Il n’est que la conséquence des articles signés Vandérem et autres, qui méconnaissant la composition de mon ouvrage ont l’air de dire que je fais des ‘mémoires’ et écris au fl de mes souvenirs [...]”). To Jean-Louis Vaudoyer, n.d. [May 7, 1919]. 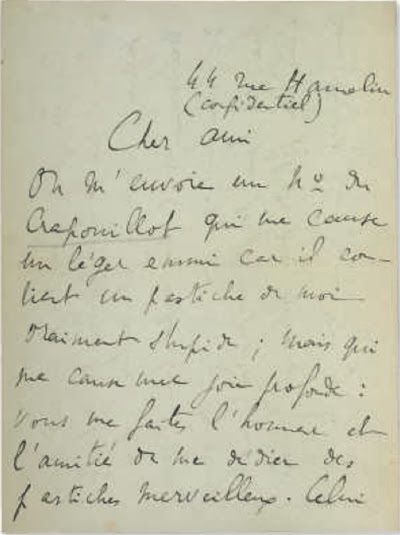 In a three-page letter, Marcel writes to his friend, Jean-Louis Vaudoyer, and alludes to Les Permissions de Clément Bellin, Vaudoyer's novel published in 1918. "Wednesday, Reynaldo wrote me that he will probably dine and leave immediately afterward… I suffered so yesterday when I wrote that I have the impression that thinking has extraordinary and silent night with the mulatto, and other overhead of Peahen, I love talking about the Peahen and Peacock. I called this last name or the hero that you are a 'given' papers (you should remove that had given me', nor Paonneaux painted [ ... ]." (“Mercredi, Reynaldo m’écrit qu’il viendra dîner et il partira sûrement tout de suite après. Vous ne serez que tous les deux (sauf un garçon que j’ai recueili depuis q.q. mois mais qui ne nous gênera pas car il ne dit rien) [...] Je souffrais tellement hier quand je vous écrivis que j’ai l’impression qu’en pensant à la nuit extraordinaire et silencieuse avec la mulâtresse, et d’autre part au pavillon de la Paonne, j’ai parlé des amours de la Paonne et de Paon. 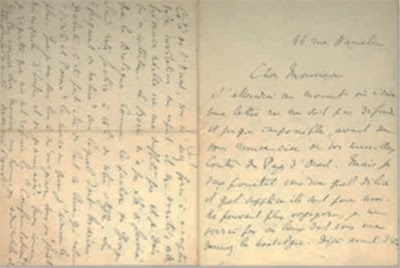 Je n’appelle de ce dernier nom ni le héros dont on vous a ‘remis’ les papiers (vous devriez supprimer ce ‘qu’on m’avait remis), ni les Paonneaux peints [...])” (Proust Correspondence. Volume XVIII. Paris : Plon, 1990 , letter 87 , p. 205-206). To Gustave Geffroy, no date (June 20 or 21, 1920). Here, Proust, in 1920, writes to his friend, the art historian, critic and novelist Gustave Geffroy (1855-1925), who wrote the first biography of Claude Monet in 1922. "I'll wait a while, what I write is not forbidden and it is almost impossible to thank you for your wonderful tales of the West Country. But I want to tell you again what a delight and punishment they are for me. No longer able to travel I cannot see those places that give me nostalgia [...] But many sites - you really live in your Tales of the West Country - I have not visited, and I never will know them. But thanks to you they surround me much more than the walls between which I am [...]." (Marcel Proust. Correspondence. Volume XIX. Paris: Plon, 1991, letter 147, p. 314-315). "Everything great in the world comes from neurotics. They alone have founded our religions and composed our masterpieces"